After spending over a year in Napa to go to culinary school and work in restaurant kitchens, I am finally back home and that means more recipes for The Original Dish! While I figure out what step to take next for my career in Chicago, I’m taking full advantage of having lots of time to cook….and eat. 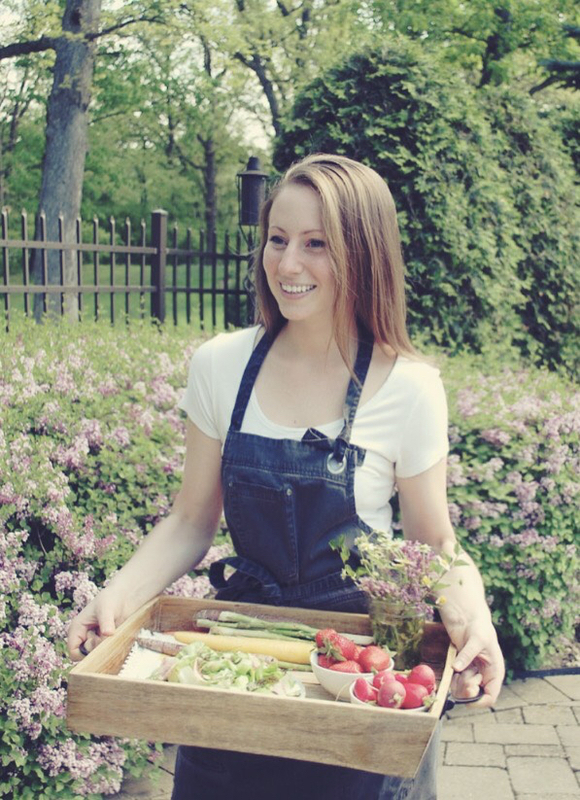 And even better, my favorite season to be in the kitchen is in full swing. I’ll be writing warm, cozy, festive recipes all season long. 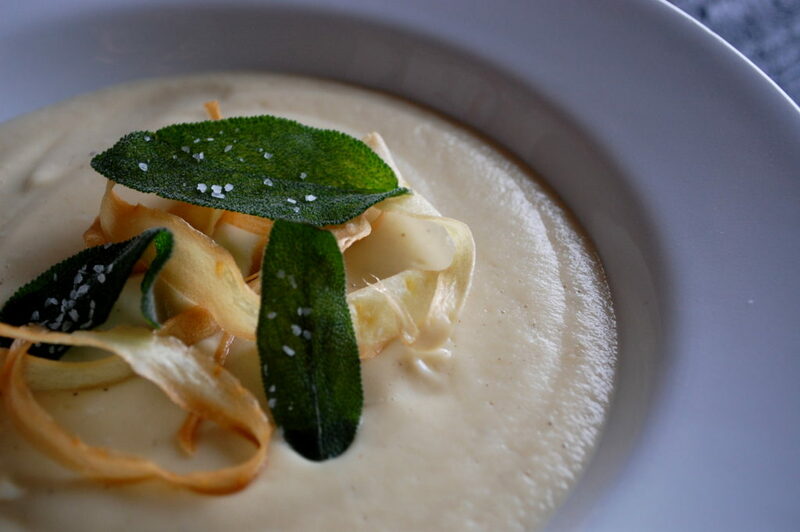 Starting with this parsnip soup. You can’t really go wrong with soup in the winter. If I’m not making a soup that has just about everything but the kitchen sink in it, I like to focus on one ingredient. Parsnips have such a delicate flavor. 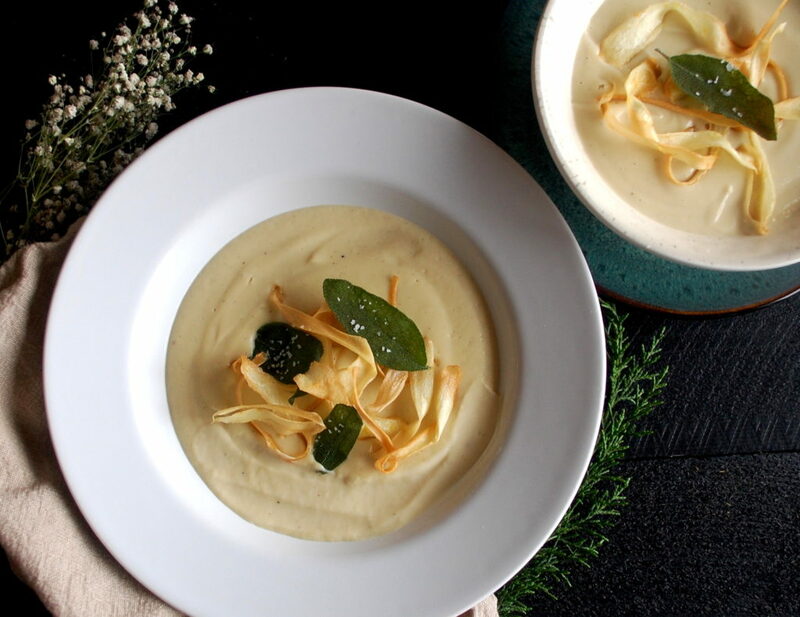 The addition of intensely caramelized roasted garlic is just enough to add some bite to the soup. 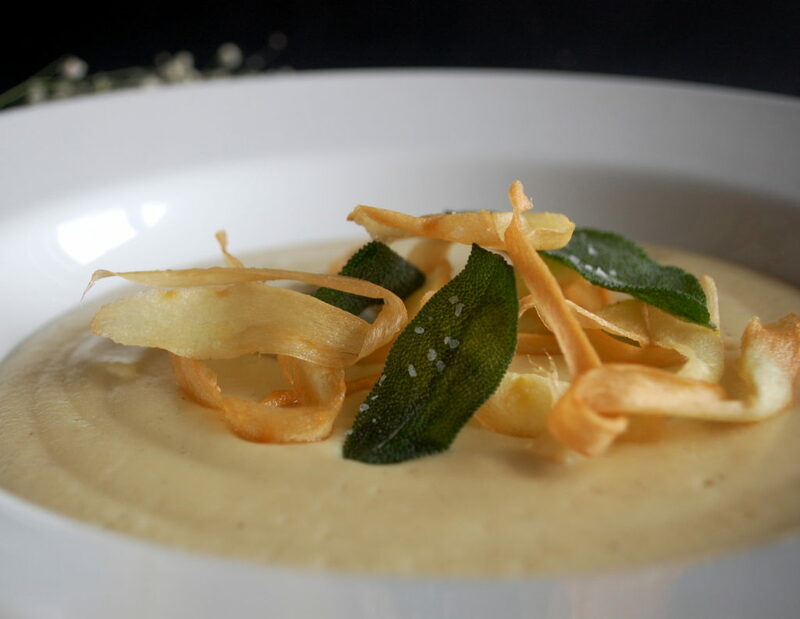 The creamy soup needs crunch on top so I shave strands of parsnip and fry them until golden. A little fried sage adds some more crunch and beautiful color. When you are blending the soup, keep an eye on the consistency. It may be too thick or too thin depending on how much the stock reduces when the soup is simmering. Therefore, I would blend in batches so that you can control the amount of stock you add in from the pot. If the soup is still too thick after adding all of the stock from the pot, you can add more cream than suggested in order to thin out the soup. Seasoning the soup properly is also crucial. This soup especially is very simple. 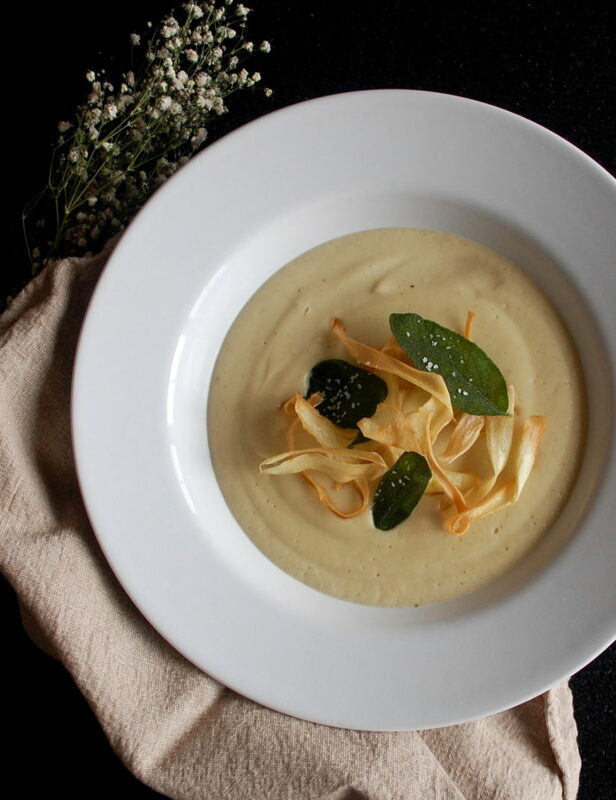 It relies on the pure taste of the sweet parsnips and slight strength from the garlic. Without enough salt to really bring out those flavors, the soup will be bland. With too much salt, it will be overpowering and inedible. Make sure to add salt slowly and to taste along the way so that you can reach the perfect amount. Enjoy! Preheat the oven to 400°F. Trim the top off of the head of garlic, leaving the root intact. Create a foil “purse” around the head of garlic and place in the oven. Roast until the garlic is tender and caramelized, about 1 hour. Let the garlic cool enough to handle. Squeeze the head of garlic to retrieve the roasted garlic cloves. Set aside. Coat the bottom of a medium pot with olive oil and heat over medium-low heat. Add the onion and sweat until translucent. Add the cubed parsnips and season with salt and pepper. Saute for about 3 minutes. Add the stock and bring to a boil. Reduce the heat to a simmer and cook until the parsnips are tender. Using a blender, blend the soup until smooth. Add cream and blend until incorporated. Season with salt and pepper to taste. Strain the soup, using a rubber spatula to help the soup run through, and keep warm until serving. Add about a ½ inch of oil to a medium sauté pan. Heat over medium-low heat until the oil reaches 300°F. Meanwhile, peel the parsnip and cut off each end. Continue to peel the parsnip so that you create thin strands. Working in batches, add the strands of parsnip to the oil and fry until crisp. Remove the strands with a slotted spoon and drain on a paper towel-lined tray. Season with salt immediately. Repeat this process with the remaining parsnip strands. Repeat again with the sage leaves. 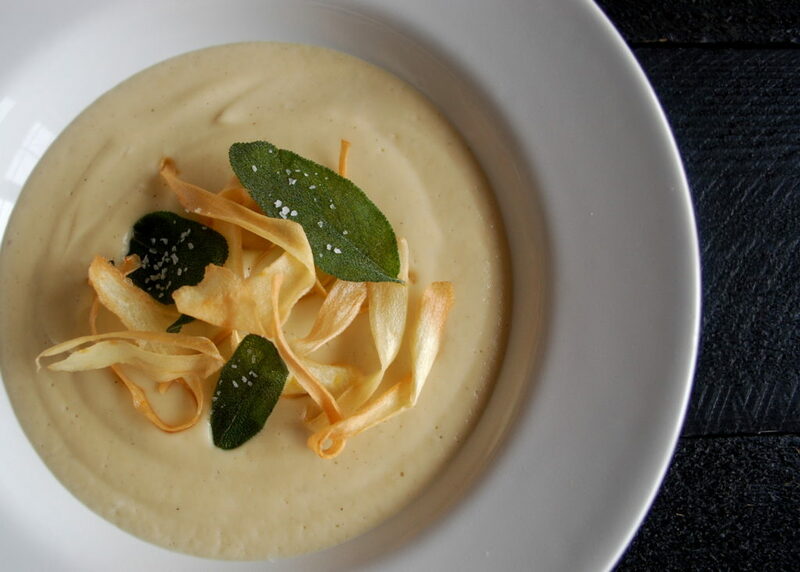 Ladle the soup into a bowl and top with the fried sage and parsnip chips.